I hadn’t originally planned on making carrots as part of my Weekend with Julia, but they were a suggested side dish to Beef Braised in Wine, and I had all of these extra carrots lying around from making the beef, so I thought, why not? This is a really basic carrot recipe with the flavor reminiscent of glazed carrots, but without the heavy glaze. 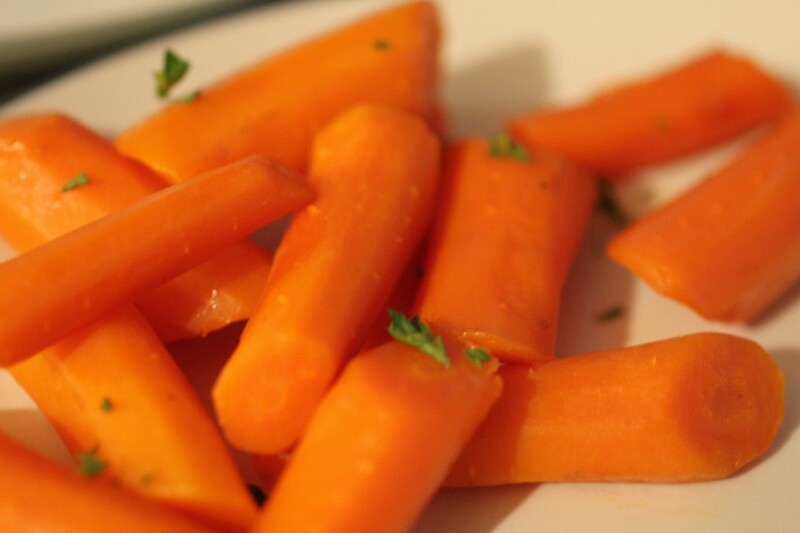 I will definitely be making these again, as this simple recipe turned some sub-par carrots into a very tasty side dish. Combine carrots, sugar, water, butter, and salt in a medium saucepan, bring to a boil. Cover and boil slowly for 30-40 minutes or until the carrots are tender and most of the water has evaporated. Correct the seasoning. *I used brown sugar, as it was all that I had on hand. Hey – Cool webpage! Have you seen the movie “Julie and Julia?” I thought Meryl Streep was really funny in the movie and Amy Adams was good as Julie Powell! Keep on doing what you are doing with your webpage! Sincerely, Lisa Reid. ps. please do not give my email address out to anyone else. thank you! Lisa, I watched that movie specifically because I wanted to see Meryl play Julia. And don’t worry, your e-mail address is safe – it’s just a WordPress requirement to leave comments. Saturday, August the 24th, 2013- Dear Sara- Hello, and how are you these days? Sorry i have been sooo slow in getting back to you! It’a just been awhile since i thought to check on your latest posting! It looks like you’ve been really busy since we last communicated! I havae been busy too, with school, but it is still summer, as you can tell by the date i am sending you this very belated reply, and i want to let you know that i am moving on the 29th of this month! Also, I will have a new email address, as i will be with Rogers’ Cable! I will email you as soon as i have settled, but please note that i will not have phone or internet connections until after this coming September, the 16th! I hope all is well, take care, sincerely, Lisa Reid.